Small groups are a huge part of the life of many churches today. Small groups exist to help get people connected in biblical community that helps them become more like Jesus in every area of their lives. Many will even point to the life of Jesus as an example of what a small group looks like. Jesus chose twelve men to be with Him as He traveled and taught these twelve disciples to learn about God. He ate with these men, He taught them the Scriptures, He even allowed them to ask questions, and He modeled for them what it meant to be Christ-like. Small groups are clearly an important part of the church today. Some groups struggle with what topics or resources to use in their groups. This article lists 7 of my favorite Small Group studies that I have used personally. This study will help you think through a topic that intersects the life of every person walking this planet; the topic of finding God’s will for our life. I could fill this entire list with studies by Andy Stanley as I have used and taught thru each one that he has released but somehow this one is my favorite and most memorable. The first session is so powerful in helping us to begin to understand how we can look for the leading of God in our life. Stanley writes about the 3 “wills” of God which are the Providential Will of God (the things God is going to do regardless of us or our faithfulness), the Moral Will (the things God specifically commands us to do), and the Personal Will (the individual choices that we have. Each session builds on the one before and gives some practical thinking to this sometimes-difficult topic. Andy helps us understand that the more we know the Providential Will and the more we obey the Moral Will of God, the easier it will be to know the Personal Will of God for our lives. This study is memorable and very practical teaching for people at all stages of life. I have to admit that this video was far different than I thought it was going to be. Francis Chan is obviously so gifted in his ability to communicate God’s word in a simplified way but I wasn’t expecting Crazy Love to impact me in the way that it did. This study begins by having you think through the fact that all of us (every Christian) should want more from our Christian life than just what Chan calls the “status quo.” He makes you think through your own spiritual life to see if you hunger for an authentic faith that will make you live in radical ways for Jesus Christ. This DVD study goes along with the book by the same title. One session that Chan writes about is “Serving Leftovers to God.” That is a chapter that I need to read on an ongoing basis. It is a humbling chapter for anyone to read and evaluate their own “offerings” to God. This is a study that some people may have difficulty with because it is so convicting. But don’t let that scare you. This is a study that your group should fully enjoy. Small groups are clearly an important part of the church today. This study by Pam Gillaspie is an inductive study on the great hall of faith chapter of the Bible, Hebrews 11. This study teaches the big picture of what God is doing by using the summary chapter of Hebrews 11. This study is a book study only. The author does have some videos online that can be helpful when leading this study. This study is an application-based study that is very rich for people at all phases of their spiritual journey. The study has some very straightforward discussion questions that make the learner ask simple and sometimes basic questions of observation. However, this study is jam-packed with much deeper options for those wishing to dig and dig through this great chapter. Pam helps get you started on doing your own word studies and even helps get you to look up words in both the Greek and Hebrew languages that will further enrich your study as you lead your group through Hebrews 11. The Prodigal God is a six-week for either small groups or for a church wide campaign. Timothy Keller is a powerful teacher of the word of God. Throughout this book and study, Keller uses the character traits of the Father (who represents God that is abundant in showing grace and love), the young brother (who runs away and is spiritually empty), and finally the older brother (morally upright). Keller is an excellent writer and his illustrations help the reader grasp what was going on during the culture when Jesus was walking on this earth. Some DVD studies almost don’t need the leader to do much more than show up and pop in the DVD and lead a few questions afterwards…this is NOT one of those studies. The first DVD session is approximately 40 minutes but the rest of the weeks have only a short introduction video that only last a couple of minutes. Thus you, as the leader, must be prepared to lead the group. I highly recommend each group member to be reading through the actual book while studying this study. With all of that being said, this is a great look at this familiar story but told in Keller’s style in which he has you interact with the gospel of Jesus Christ in a memorable fashion. This DVD study by well-known teacher Ray Vander Laan is a well done study with visual images that help aid the teaching of this small group study. Ray takes your group on a journey back to the ancient times and actually films this study with a group of followers in Israel and Turkey. Ray helps the modern day follower of Jesus understand what it meant to be a follower of Jesus during ancient times and then asks us (modern day Christians) to do the same. The imagery behind the title of this DVD (In the dust of the Rabbi) is explained in detail by Vander Laan as he details how a follower of a rabbi during ancient times would mean walking so close to the rabbi that they (the follower) would literally be covered by the dust that comes off of the feet of the rabbi. This picture is made vivid by the teachings that Vander Laan does to a group of people that are literally following him around historical sights in Israel and Turkey. This study has a “real” feel as you can imagine being on a spiritual pilgrimage through the holy lands. Ray Vander Laan is certainly not a boring speaker but maybe not as gifted as some of the communicators listed above. However, the information that he teaches in and thru this DVD is so informative that one can not help but be inspired to deepen their own walk with our supreme rabbi, namely Jesus. This study is very unique and a must have on your shelf. This DVD study is best used with both the book and study guide. One of the things that I love about Craig Groeschel is how he understands the current culture but also knows how to teach Scripture in light of the current culture. This is an area that many teachers struggle with but Groeschel is the exception. This study is a look at the 5 most damaging issues in our culture. The five are; Lethal Language: Experiencing the Power of Life-Giving Words, Scare Pollution: Unlocking the Chokehold of Fear, Radioactive Relationships: Loving Unhealthy People without Getting Sick, Septic Thoughts: Overcoming Our False Beliefs, and Germ Warfare: Cleansing Our Lives of Cultural Toxins. The study guide is perfect to lead meaningful discussion questions and the DVD sessions are in my mind a perfect length (11-13 minutes) for most groups. The study guide encourages the participant to further engage in what was learned each session. This is a great study to invite friends or any contacts that are not currently followers of God. This is my number one small group tool. If you are a small group leader and do not own this resource I recommend that you order it right away. Simply, this is a typical NIV Bible but designed specifically for the small group leader. Each page of Scripture has helpful tools and discussion questions that are helpful in leading your group. Some passages have committed sections where there are multiple choice discussion questions that will engage the reader to not only study the story or passage of the Bible but it will ask questions in a way that make you try to understand the passage in light of the current culture that we live in. Some questions are simply introduction questions (signified by a coffee cup symbol) that will help get your group thinking about a topic that the Bible will speak about. Other questions are deeper and will have group participants asking themselves application style questions. Most books of the Bible give the group leader the option of going fast through the book (6-8 weeks) or for a slower and deeper study (12-15 weeks). 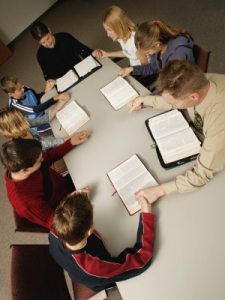 There are even group specific topical discussions that study a topic throughout the Scripture. This Bible can be purchased for approximately the same price as many DVD studies (around $23 currently on Amazon) and is so valuable. These seven studies are some of my favorite small group studies that I have used in my years as a small group coach and small group leader. There are obviously many studies to choose from but I think it is important to give your group some different kinds of studies to keep things fresh in your group. Sometimes it is good to use a DVD study but maybe mix it up with an actual book of the Bible study or even better yet, create your own using some of the resources available. Many times I will buy a study guide and use it alongside of my other resources (such as the Serendipity Bible and even other commentaries) and create my own study for the people in my group. That approach is sometimes scary for some group leaders but is so freeing and energizing when God speaks to you while you study His word on your own. Give it a try today. It gets even better with defined methods as you have listed here. I’d add Pilgrim Theology, by Dr. Michael Horton, to this list. Due to the confusing stance on homosexuality that Andy Stanley preached to his congregation, I can’t prescribe to his teachings in other areas if he fails on this important point. Bible studies must be a study of the Bible rather than studies of what some wish the Bible said. Like many megachurches, Stanley may believe that he cannot afford to offend the rising numbers of homosexuals who are coming out and into public notice, yes, even in churches. Like adultery, divorce, and other issues, the Bible declares its position, and we try desperately to make it all okay because we need people. Sad. I really like the prayer group photo. Do you think I could use it for our church website? We are trying to promote a small group. I am just checking for copyright. Thanks and looking forward to hearing back from you. Hello Magan. Please click on “Contact Us” to see if you can use the group photo. Thank you.